44% of men survive oesophageal cancer for at least one year, and this is predicted to fall to 16% surviving for five years or more, as shown by age-standardised net survival for patients diagnosed with oesophageal cancer during 2010-2011 in England and Wales. Survival for women is slightly lower at one year but similar at five years, with 38% surviving for one year or more, and 15% predicted to survive for at least five years. Oesophageal cancer survival falls only slightly beyond five years after diagnosis, which means most patients can be considered cured after five years. 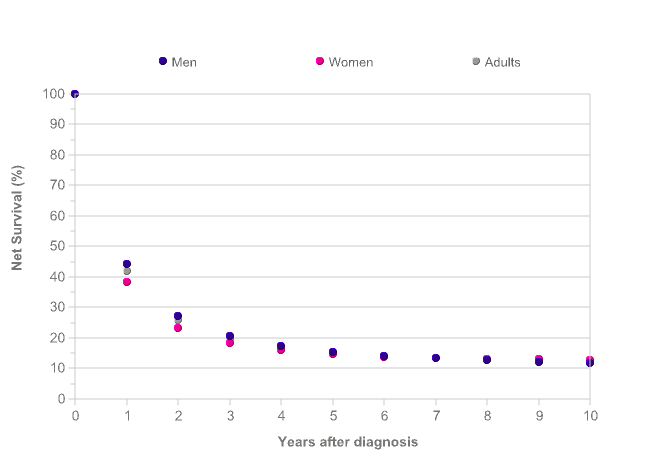 12% of men and 13% of women are predicted to survive their disease for ten years or more, as shown by age-standardised net survival for patients diagnosed with oesophageal cancer during 2010-2011 in England and Wales. Out of 20 common cancers in England and Wales, ten-year survival for oesophageal cancer ranks 3rd lowest overall. Survival for oesophageal cancer is reported in Scotland and Northern Ireland,[2,3] though it is difficult to make survival comparisons between countries due to different methodologies and criteria for including patients in analyses. Data were provided by London School of Hygiene and Tropical Medicine. Personal communication on request, 2014. Five-year survival for oesophageal cancer decreases with increasing age. 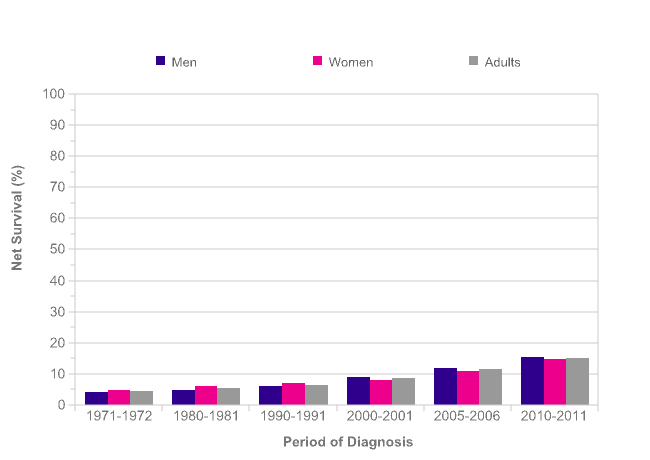 Five-year net survival in men ranges from 18% in 50-59 year-olds to 6% in 80-99 year-olds for patients diagnosed with oesophageal cancer in England during 2009-2013. 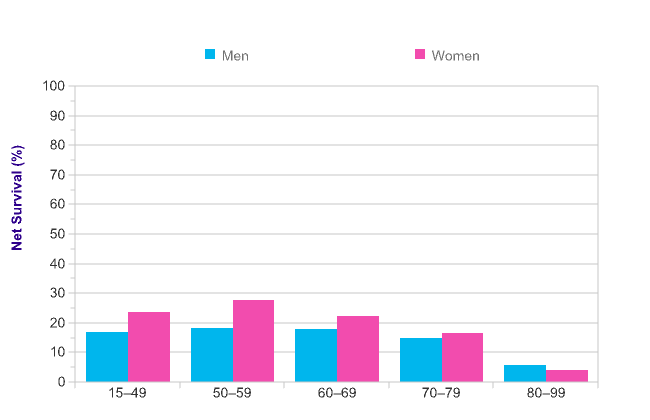 In women, five-year survival ranges from 28% to 4% in the same age groups. 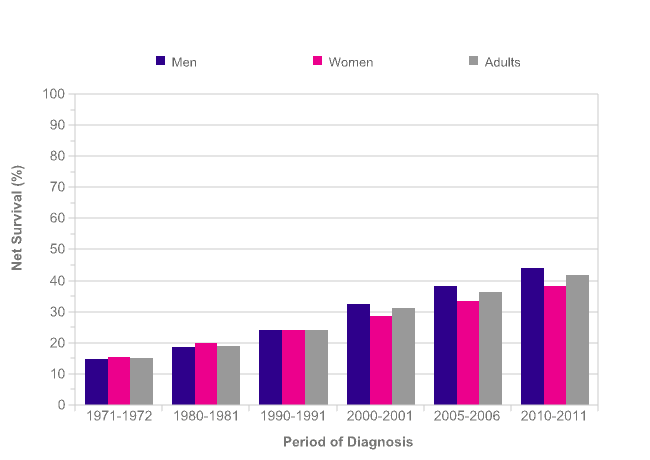 As with most cancers, survival for oesophageal cancer is improving. One-year age-standardised net survival for oesophageal cancer in men has increased from 15% during 1971-1972 to 44% during 2010-2011 in England and Wales – an absolute survival difference of 29 percentage points. In women, one-year survival has increased from 16% to 38% over the same time period (a difference of 23 percentage points). Five- and ten-year survival has increased by a lesser amount than one-year survival since the early 1970s. Five-year age-standardised net survival for oesophageal cancer in men has increased from 4% during 1971-1972 to a predicted survival of 16% during 2010-2011 in England and Wales – an absolute survival difference of 11 percentage points. In women, five-year survival has increased from 5% to 15% over the same time period (a difference of 10 percentage points). Ten-year age-standardised net survival for oesophageal cancer in men has increased from 3% during 1971-1972 to a predicted survival of 12% during 2010-2011 in England and Wales – an absolute survival difference of 9 percentage points. In women, ten-year survival has increased from 4% to 13% over the same time period (a difference of 9 percentage points). Overall, more than 1 in 10 people diagnosed with oesophageal cancer today are predicted to survive their disease for at least ten years. Five-year relative survival for oesophageal cancer in men in England (12%) is similar to the average for Europe (12%). Wales (13%) and Scotland (11%) are also similar to the European average but Northern Ireland (15%) is above the European average. 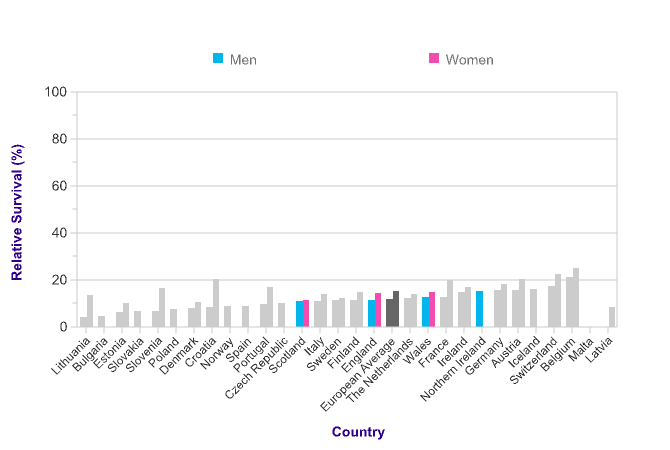 Across the European countries for which data is available, five-year relative survival in men ranges from 4% (Lithuania) to 21% (Belgium). Five-year relative survival for oesophageal cancer in women in England (15%) is similar to the average for Europe (15%). Wales (15%) is also similar to the European average but Scotland (11%) is below the European average. No five-year survival data is available for Northern Ireland. Across the European countries for which data is available, five-year relative survival in women ranges from 9% (Latvia) to 25% (Belgium). Data is for: 29 European countries, patients diagnosed in 2000-2007 and followed up to 2008, oesophageal cancer (C15).